Anyhow, before my day with throat fuzzies, my past two days in Vienna (might be a bit lengthy; I crammed two days into one post)! 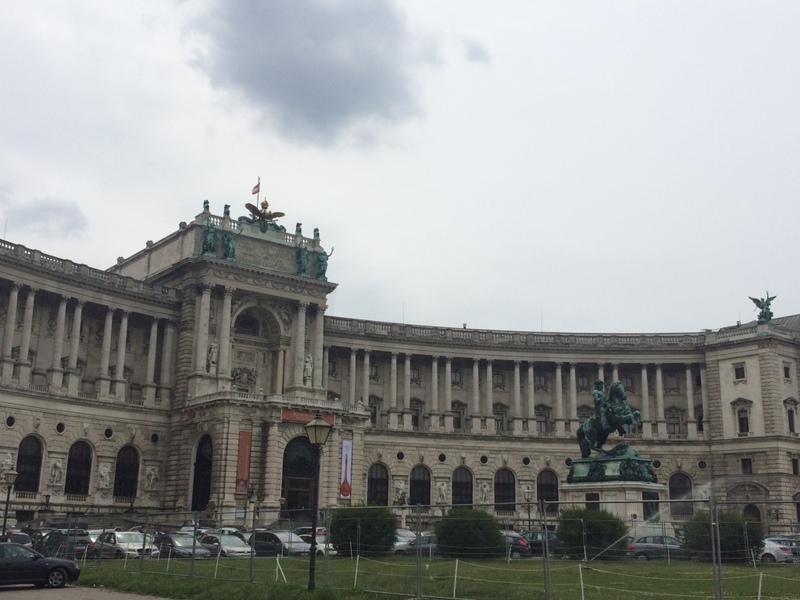 Toured a lot of the highlights - Vienna has museums for days, as well as some pretty legit royalty-related buildings. 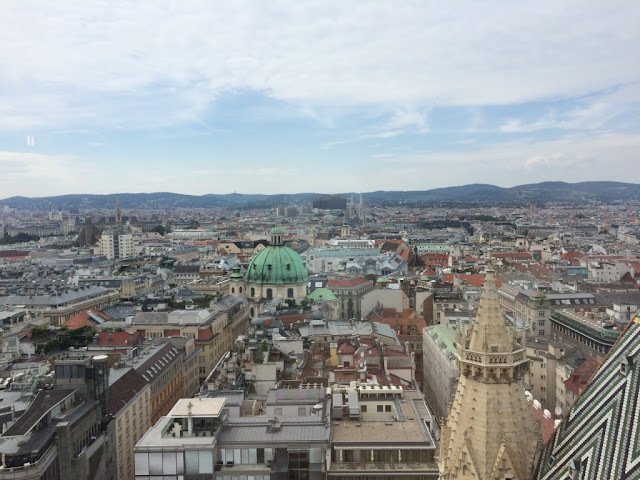 Back in the day, when it was a European powerhouse city, Vienna was ruled by the Hapsburgs, which is one of the most royal of the royal families. Hence everything is opulent and fancy and beautiful. 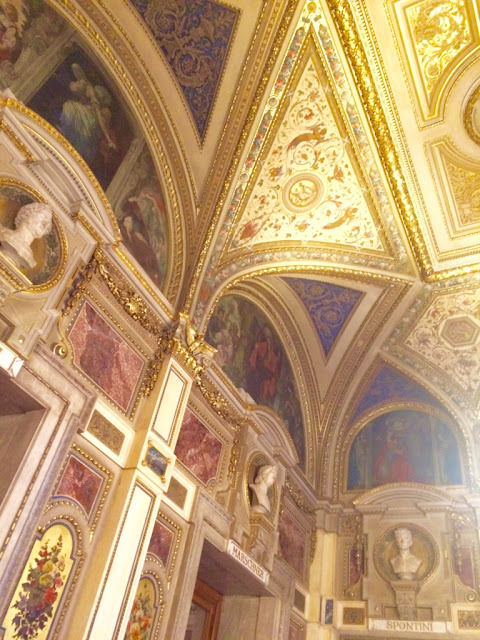 Went to St. Stephen’s Cathedral, the most baller/iconic church in the city. It took 150 years to build and it’s on the 10-cent coin. The detail inside is really intense; and you can also climb the two towers (North & South). The South Tower is higher because it was built first, and as they were constructing the North Tower….war broke out and they ran out of materials, so it’s noticeably shorter than the other one. 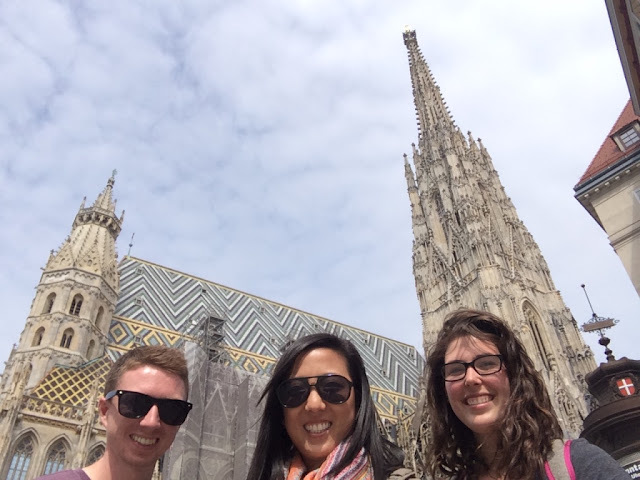 Naturally, we climbed the South Tower, which had 434 tiny wind-y stone steps and was incredibly narrow and dizzying. 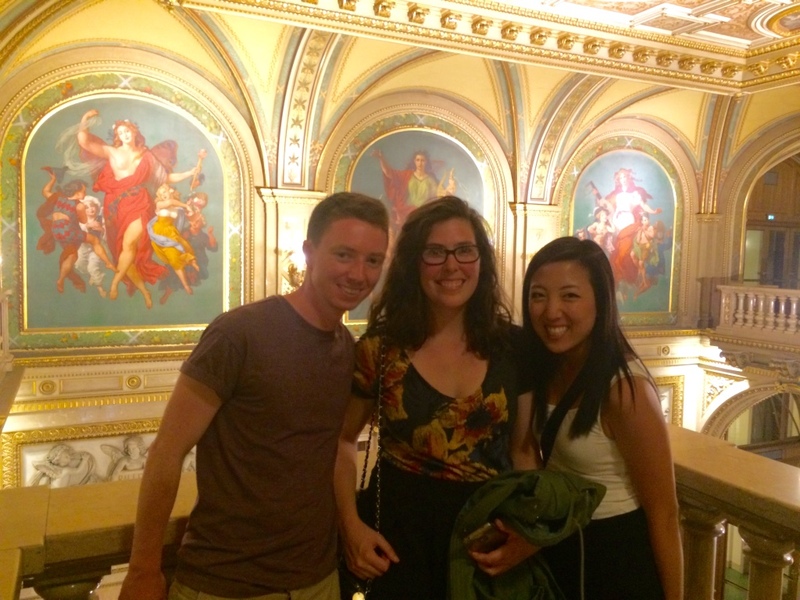 WENT TO THE OPERA - so, so exciting for me. 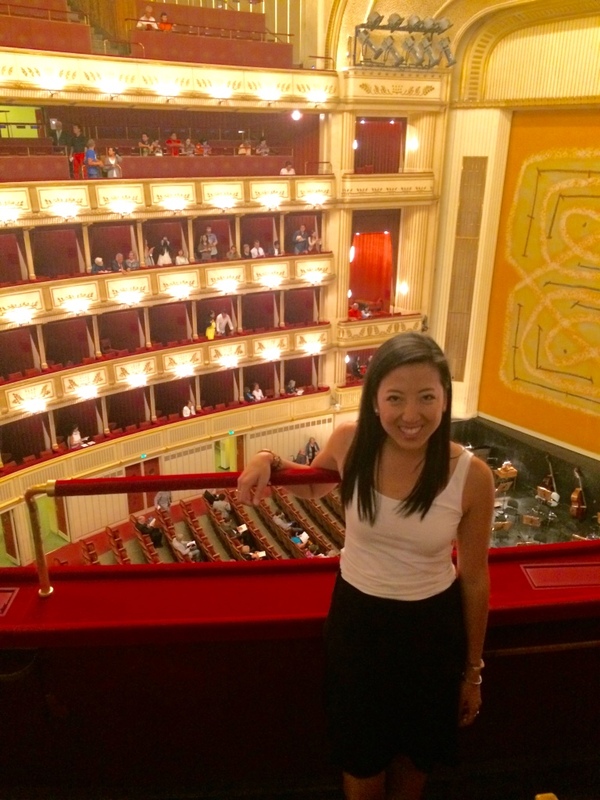 The Vienna Opera House is one of the most iconic/famous institutions in Vienna, given Vienna's long list of storied musicians (Beethoven, Mozart, Schubert, etc.). 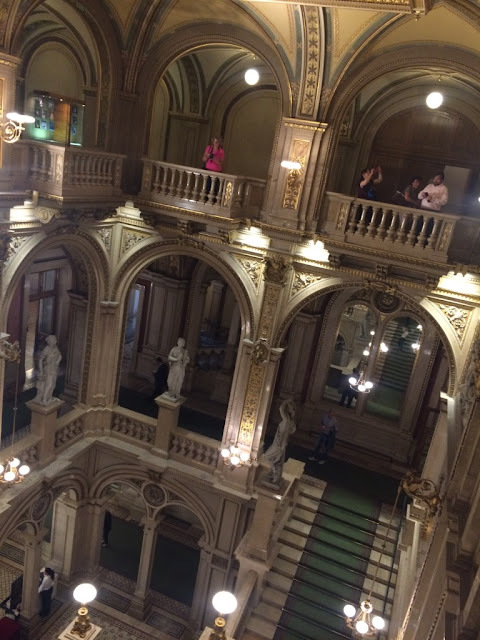 It is nothing short of incredulous - the building is larger-than-life and so stately-looking, and you can only go inside (which involves more super-ornate rooms and decor) if you take a guided tour or attend the opera itself. The place has about 2,200 seats and it sells out every.night. How crazy is that?? However, fun fact is you can get same-day standing-room tickets, AND they’re only 3-4 Euro (compared to 200+ Euro for the actual seats), which is what we did. 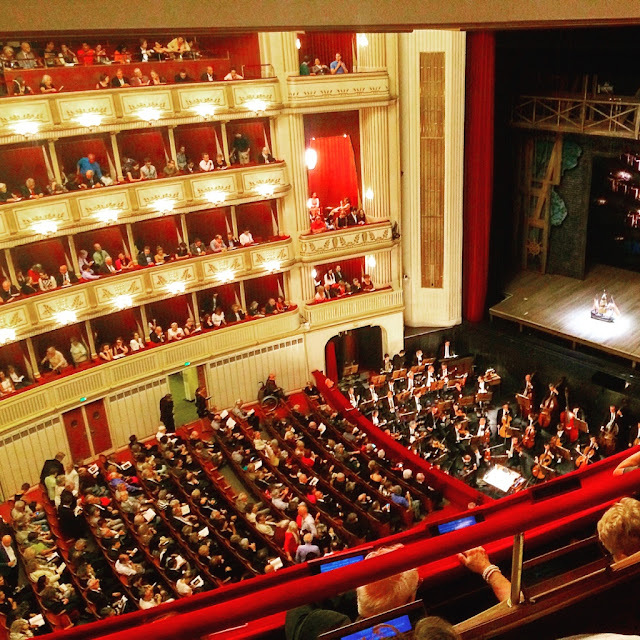 The opera last night was The Tempest, which coincidentally happens to be in English (a fact we were unaware of) - it was hilarious bc they started to sing and we looked at each other for a second being like, “wait….do we suddenly understand German?” We didn’t make it the entire 3 hours, but it was such an experience: seeing Vienna all dressed up, walking through this awe-inspiring decorated building, the singing…..sigh. Details on room walls. This is just the room they sell refreshments in! 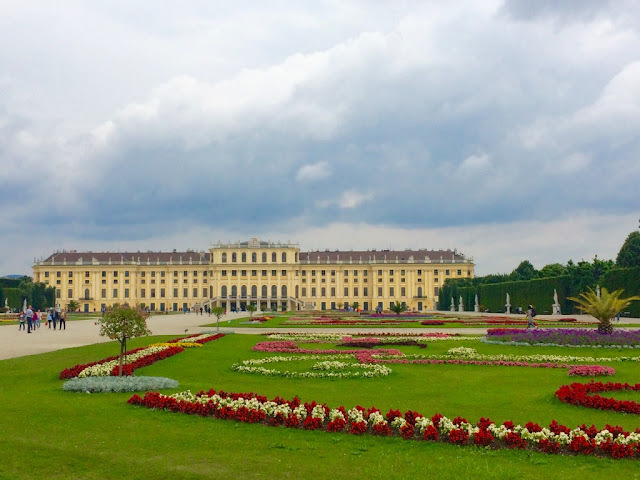 You can tour both the Hapsburgs' downtown-palace (Hofburg Palace), and their Versailles-esque summer palace (Schoenbrunn Palace), which both have preserved some of the "I have more money than God" rooms from the monarchy. 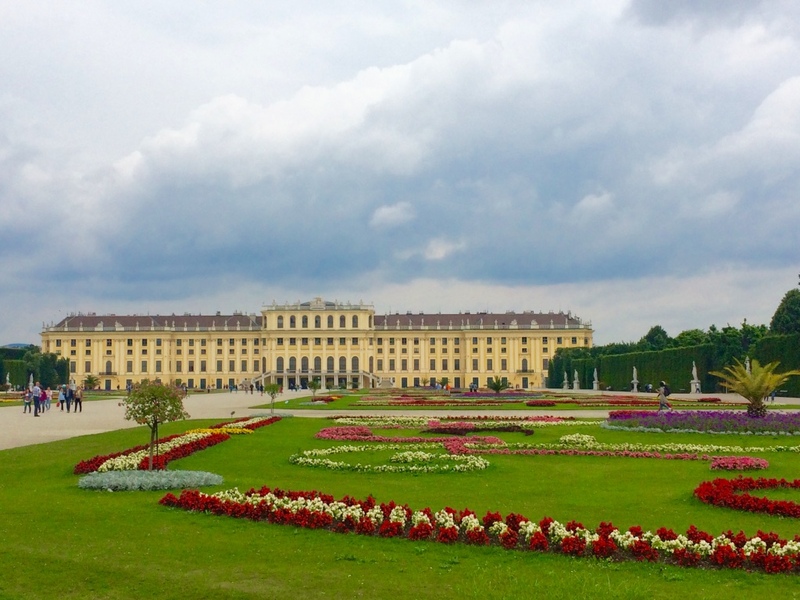 Today, I chose to tour Schoenbrunn Palace, the summer palace, bc it's bigger (obvi) and has these gorgeous gardens. The palace has over 1,400 rooms but only 40 are open to the public….and the rooms were amazing. Clearly someone was making it rain back in the day. No photos allowed inside, but I secretly took this one of the ballroom. 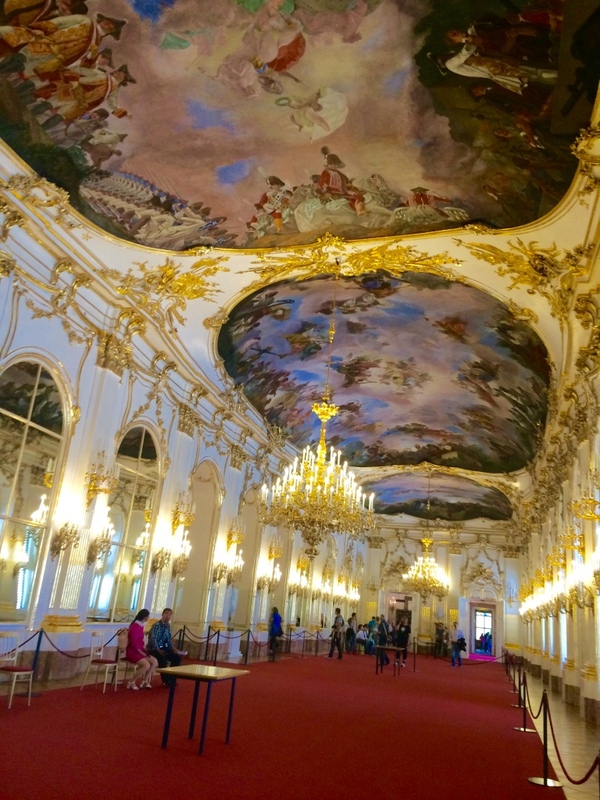 Look at the detail of the frescoes - 1,440 rooms of this?! 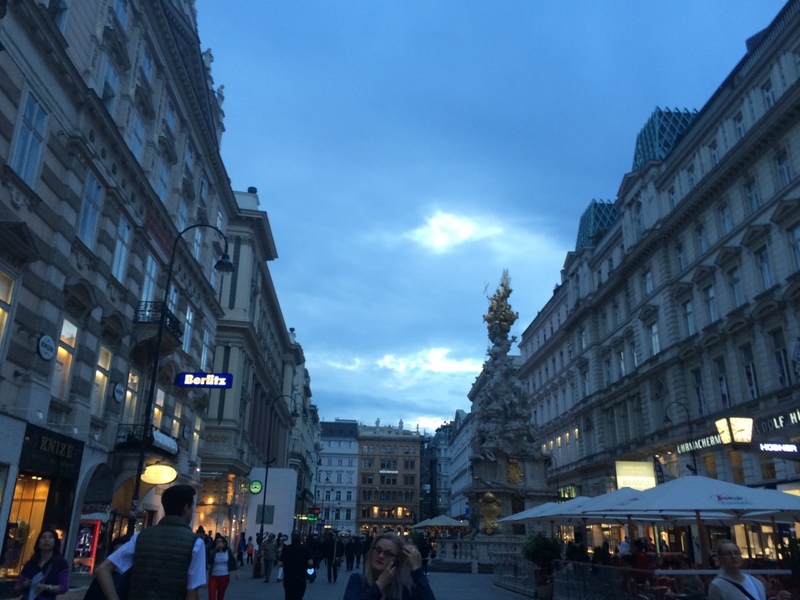 Vienna has maybe the best cafe culture ever. 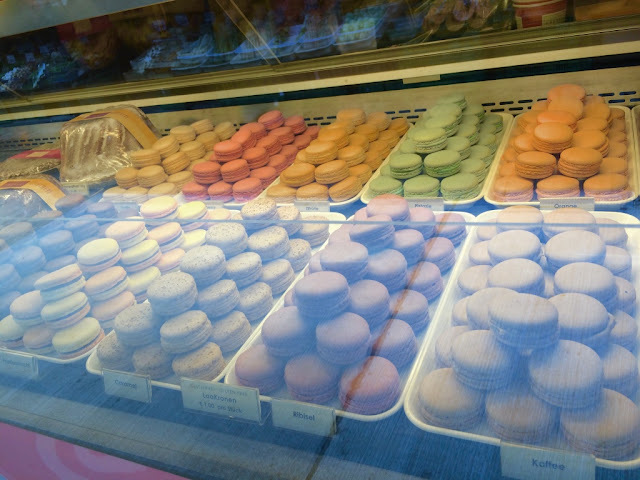 They are known for their gorgeous cafes, where you can literally sit in all day and relax, maybe order a pastry. Our guide was saying you could order one coffee and spend the day sitting there, and nobody will care or pressure you to leave or anything. My kind of people. 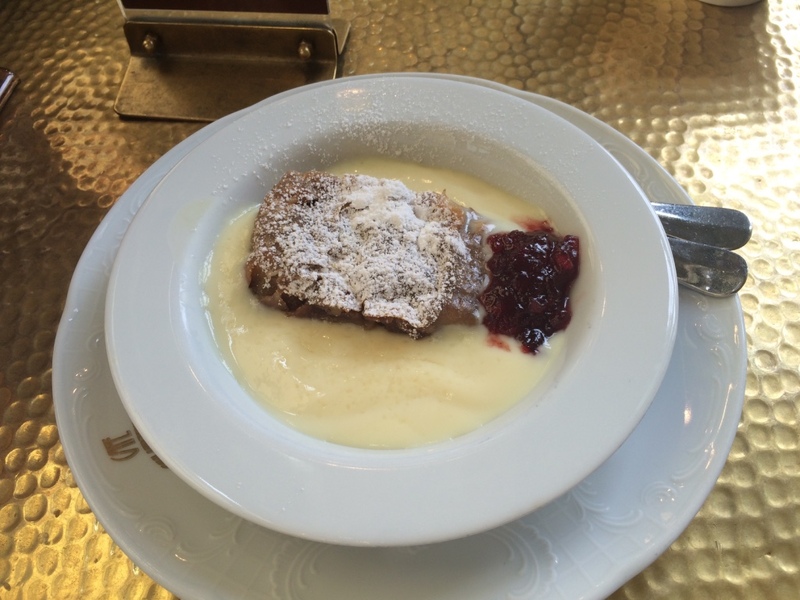 This morning, feeling slightly under-the-weather, I headed down to Cafe Schwarzenberger, Vienna’s oldest cafe. I had a cafe melange and an apple strudel (the two most well-known Viennese things; a.k.a. I’m sure they knew I was a complete tourist). I think I could live in Vienna eating desserts forever. They speak German. Yes, this is a fun fact. 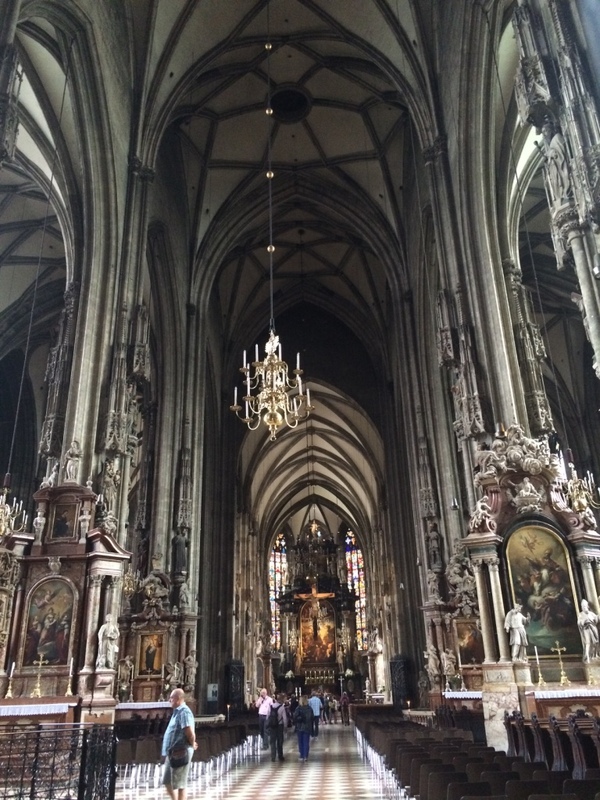 While we were at St. Stephen’s Cathedral, I was reading its history from my guidebook aloud to my companions, and an older gentleman was kind of hovering nearby listening. We struck up a conversation - he’s American and lives in Austria bc his wife is Austrian, and he was passing time in the cathedral while waiting for his train. 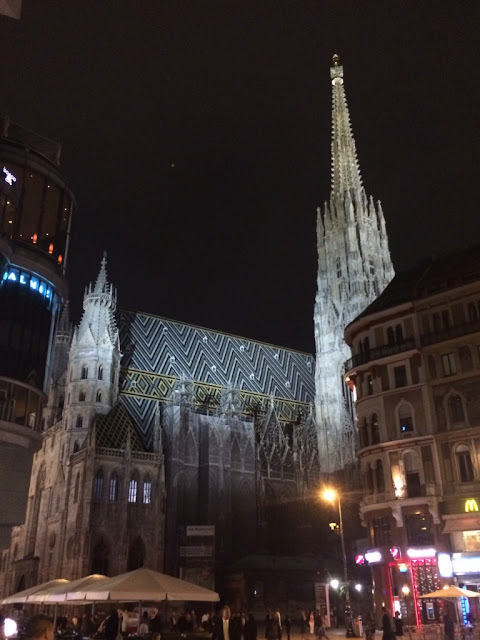 I asked him for recommendations in the city, and he said we should check out one of Vienna’s many underground wine cellars - it’s like a pub, but featuring wine instead, and they involve food and good times. I wrote down the name of one of the wine cellars he recommended. After the opera, we were hungry and looking to get a drink, so I suggested we find this man’s wine cellar rec, called Esterhazykellar. It was SO CUTE. 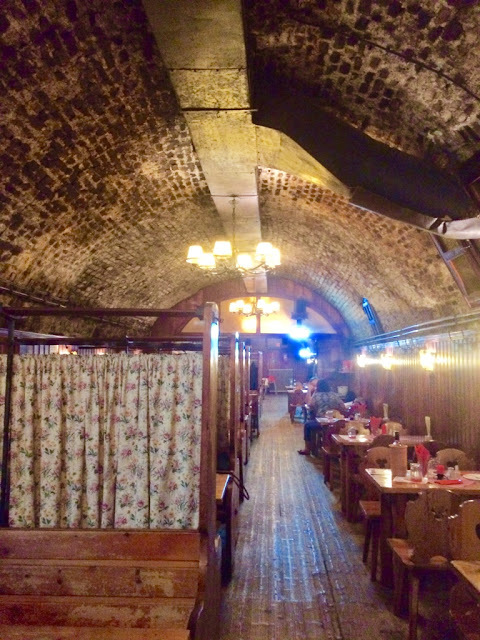 It was underground from one of the palaces, and involved a cavernous room with tons of wine options and traditional Austrian dishes. I loved the ambience. 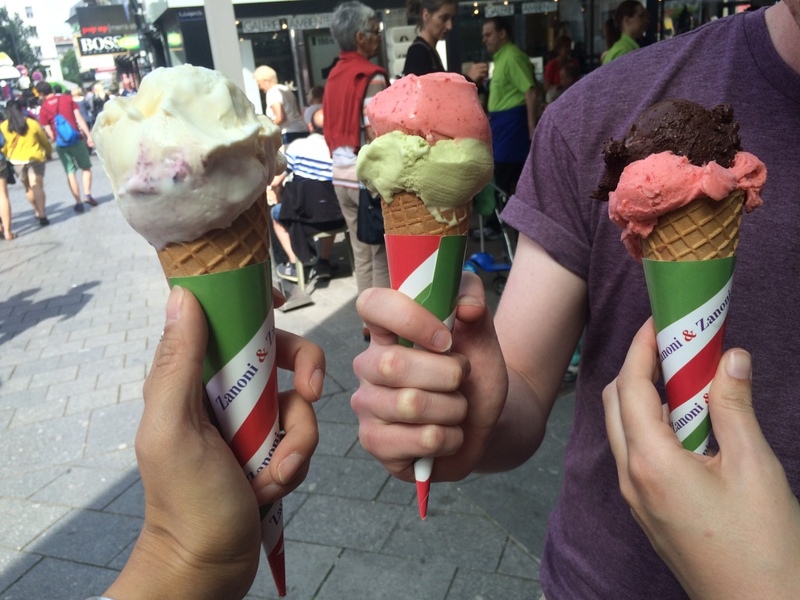 Thank you, awesome stranger we met in the cathedral, for the rec. Under a palace, adorable wine cave! My favorite part of this post is: "I was reading its history from my guidebook aloud to my companions, and an older gentleman was kind of hovering nearby listening. 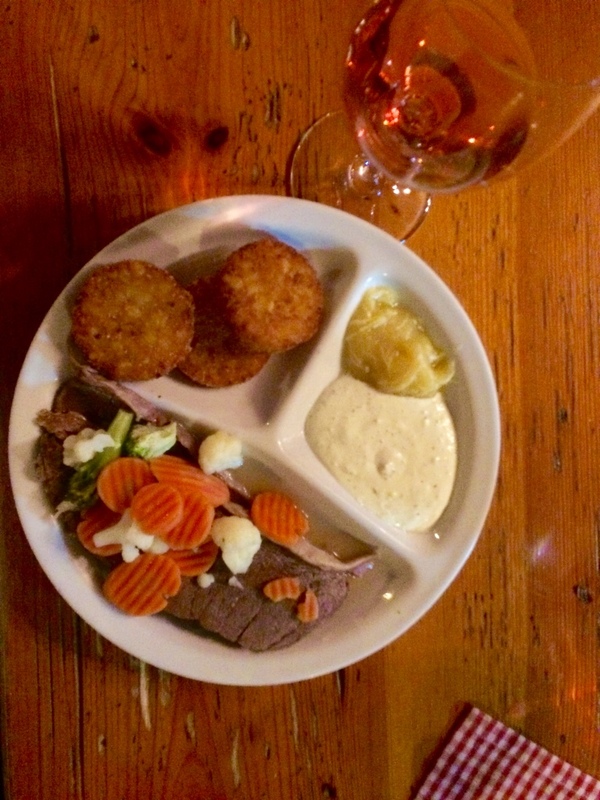 We struck up a conversation." Connie Wang has never met a hovering stranger that she didn't like. Also, I think it's great you were reading aloud - offering a public lecture to all who would listen. I'm obsessed with all your posts so far! I love that you make new friends in every city you go too. How very Connie Wang! Also, who knew boiled beef could look so cute! Miss you tons, but so glad you're having such an amazing time so far! BUT THE MORE MEDS I TAKE, THE LIGHTER THE PACK IS. I miss you and Crunch 'n Brunch and NYC tons! And so glad to know that sometimes my essays get read.